Embracing the low-carb diet is something that can be difficult. Locating food groups and selections that meet the real food requirement is something that is also treacherous. Adopting these eating habits makes up the core of the ketogenic diet. Low-carb selections coming from real food items make up the menu selections for this diet. While we’d like to assume finding these selections are simple, the truth is they are hard to find. 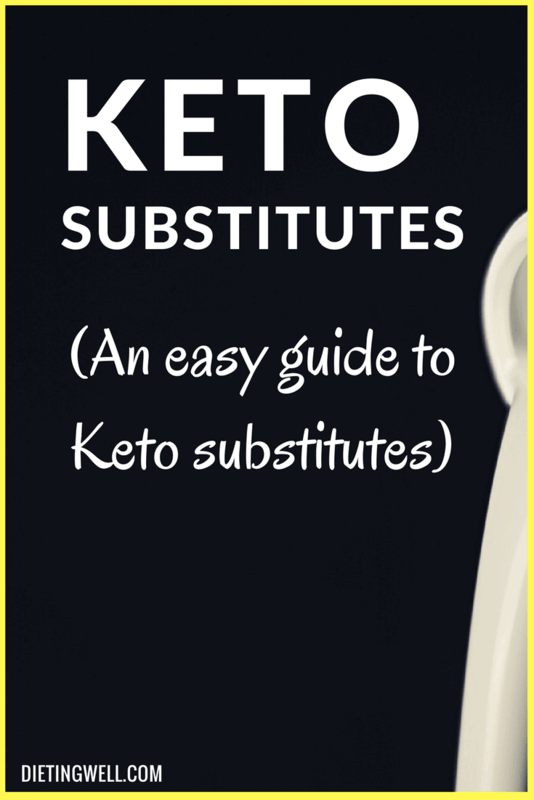 Below is a list of substitutes that meet the requirements of the keto diet. These substitutes come from favorites we often enjoyed before we took on this new diet. Each item contains ingredients that make it keto-friendly and ideas of how you can mix these items into your daily intake amounts. Lactose and ingredients found in dairy products are big red flags in the keto diet. Milk, cheese, yogurt, ice cream, and a bevy of other products fall into this category. Substituting for these items starts at the condensing phase. The keto diet is very specific, meaning the written rules often limit the items you can take in from these mentioned dairy products. The line is drawn in a fine manner but leaves room to play around with your food to create different combinations. These combinations can help remove the unwanted substance and replace it with an item that fits within the scheme of your diet. Take eggs for example. It is a common myth that the most nutrition of an egg comes from the egg whites. The keto diet supports the use of consuming the entire egg. Make sure the eggs you buy are organic, as this limits the amounts of processing and additional ingredients that could be added into your eggs. Milk replacements are not an uncommon need of those hosting the keto diet. Milk is high in lactose and other unwanted ingredients. Remove the lactose by consuming coconut milk. If you are looking for a little more flavor, try mixing your coconut milk with whey protein powder. This allows you to obtain both pure proteins and check this dairy product off of your daily intake list. Cheese replacement is a tough one. With this dairy product, you have to sacrifice some of that rich flavor for an item that may contain an acquired taste. Soy cheese is a product that meets the requirements of the keto diet and makes an excellent replacement element for cheese. Yogurts are a rather simple one. Try Greek yogurts or even a product with a low-fat cottage cheese base. These products are limited in the additives they contain and they reduce the total carb intake on your daily value plan. Ice cream can be substituted for a frozen yogurt product, fruit based bars, and other such frozen treat options. Ice cream is often high in carbohydrates, so it is important to find an item that uses all-natural ingredients in their production of this frozen treat. Potatoes represent an important vegetable for daily intake. Replacing this element can be tough, but there are a few solutions that you can take advantage off. Potatoes are rich in carbohydrates, making them prime candidates for a replacement product. If you enjoy mashed potatoes, try a cauliflower potato blend. This blend can either be produced or can be bought in a similar box fashion. This keeps the vegetable staple of your diet rich and allows you to create a healthy alternative for this meal side dish. Potato chips often represent a guilty pleasure during snack time. Replace these unnatural products with dried vegetables. Dried tomatoes, dried zucchini, or radishes will make perfect candidates for the dehydrator and replacement process. Noodle-based items can make up a bulk of the daily diet for average individuals. If you are participating in the keto diet, pasta options become limited. Below are a couple different solutions that keep similar noodle structure and limit the byproducts you no longer wish to consume. Start with substituting zucchini noodles. Zucchini is a popular food choice in the keto community, so it is no wonder it pops up in the pasta discussion. Cut the zucchini into your own size, creating angel hair pieces or regular length pasta strands with ease. Shirataki noodles make a great replacement for the pasta base. They hold a stronger texture, which could take some getting used to. One benefit that this substitute has is that it is packed with flavor, amounting to bursts that greatly exceed ordinary spaghetti strands. Everyone enjoys the trip around the drive-thru every now and again. The problem with the keto diet is that this action is now a forbidden fruit. No more trips through the drive-thru as the foods being produced in these establishes mark for items that have no place in the keto diet. Thankfully there are a few different safe alternatives that you can choose from. These alternatives lower the carb level by a longshot and greatly reduce the number of additives hosted. Burgers, fries, and pizza represent the three eligible candidates for replacement. Burgers don’t have to be limited in the keto diet. Replace your normal beef with grass fed beef and enjoy as your normally would. Replace the bun with low-carb options available at most supermarkets. If you are still searching for a healthy serving of beef, look no further than a large steak. The keto diet supports steak as a main ingredient of the daily intake amounts. A diet that approves steak is something that makes substitution a breeze. Reverting to what goes with the burger: the bun. Try cooking some portabella mushrooms to replace the bun. They can be crisped to mimic that same crunch you enjoy. If you are looking for a fry replacement, look no further than fired zucchini fries. These fries cut almost like potatoes, mimicking the shape you have come to love. They can be crisped as well to give you the desired texture. Pizza is often a tall task due to the ingredients used to make the dough. An all-flour option is a perfect fit for those looking to obtain the look and crunch of a pizza. Top with mozzarella soy cheese and you have created a successful cheese pizza replacement. Frittata and Thai flatbread represent two additional pizza crust replacement options. These items are very low on carbs and they don’t sacrifice the entirety of the taste that can be lost with a transition. Try these ingredients and mix in some additional wheat replacements to devise your very own replacement pizza recipe. Rice is both starch and carb heavy, holding no place in your keto diet. Replacing rice is as simple as creating a vegetable melody with some additional products. The combination mimics the texture you have come to know and love. Try cauliflower rice. Cauliflower can be cut down to fine amounts. When cooked or fried, the texture will be like that of rice. To make fried rice, start with the cauliflower process. You may then mix in eggs, soy, and other keto friendly ingredients to make your own fried rice mixture. This is the perfect side dish for your main courses. Replacing one of the main ingredients in the baking process is difficult, but it can be obtained. Two alternative methods are allowing people to create delightful recipes without the unwanted ingredients: almond flour and whole eggs. Both have their own special place in the keto baking process. One staple of the keto diet is to obtain an ample serving of healthy fats on a daily basis. Almond flour is very rich in these fats and it presents a safe baking alternative to flour. It brings the desired textures to the treats we develop. To obtain a rise from your almond flour, you are going to want to mix in whole eggs. The entire egg is needed to smooth out this process and to obtain the proprietary means we need to stay on track with our diet. These two products fuse to form a safe baking starter that fits the keto nutritional track. We all have a sweet tooth or two in a mouth that is full of these pearly whites. Sugar is another product that is too high in unwanted ingredients, begging for a substitute. Stevia extract and erythritol make for two great replacement options. The erythritol contains no effect on our blood sugar levels, making it a very safe substitute. It does contain sugar alcohols, but these substances are removed through urination, passing them through our system without taking the crash effects a simple sugar may possess. It is also a natural sweeter, making it a prime candidate for sugar replacement. Stevia extract is a zero calorie sweeter that is also produced in a natural sense. It can be added to coffee and other recipes to bring that sweet taste out of your creation. Both sources represent sound sugar replacement options. With all the substitute products mentioned today, it is important to draw some takeaway points. These ingredients have been selected due to the nature of their properties and the placement within the keto diet. Centering on the low-carb, good fats, and real food options is what makes the keto diet a success. The first takeaway is that you should develop a kitchen-savvy approach to these recipes. Know your way around the different kitchen utensils used in the baking process. This knowledge can help you blend and create your own recipes for these replacement options. The second is that everything has a replacement counterpart. The options presented today only represent a small sample size of different substitutes. Many of these creations are just waiting to be discovered by an individual hosting the keto mind set. The third is to always look for a better replacement and reach your daily intake levels. If a recipe calls for a fruit and you have already had your fair share of fruits, find a vegetable that would suit the job. Mix and match your combinations to ensure you reach your daily intake amounts. The last thing is to have fun with these substitutes. You can create your very own recipes and develop products that mimic your favorites. A little time, effort, and experimentation goes a long way in the keto lifestyle. Is honey a good enough sugar substitute as I am incredibly sensitive the taste of fake sugars? I have a hard time with Nuts, I can’t eat whole Almonds, can I sub Walnuts and I have a hard time with raw Carrots, celery and such, can I steam them and will that work? Be careful because nuts do have carbs as do carrots. Carrots convert to sugar as well. Steaming is fine as long as it isn’t mushy. Dead veggies do you no good. Hello. What can I use in place of mushrooms on Keto diet? By telling people to add whey protein to their coconut milk so they can avoid lactose, you are missing a HUGE problem that 50% of Celiacs have with dairy. That problem is the whey/casein that is also in the dairy, alongside the lactose. For us, this is an autoimmune reaction, just like we have when we consume gluten. For us, eating dairy causes all that inflammation in us, just like the gluten does and, in fact, makes me far sicker, quicker, than if I get accidentally cross-contaminated with gluten. If a person has a problem with ONLY the lactose, then genereally they can take lactase enzyme to corrrect that. However, so far there is NO way to treat for the casein/whey problem except to do the same thing we HAVE to do with gluten; and that is to avoid dairy products altogether. WHAT MEAT CAN I SUBSTITUTE LAMB WITH ON THE KETO DIET? I would like an answer to this question as well. We don’t care for lamb. Same here! Would love to know.